We've already shown how to build a touch sensor with a transistor in a previous project. 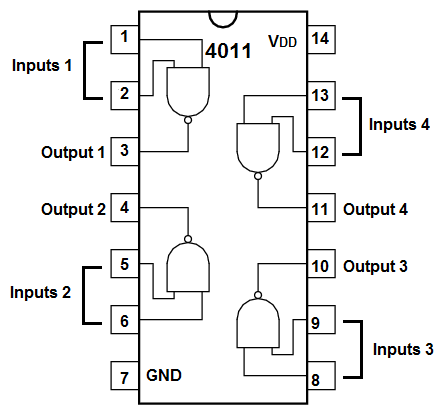 Now, in this one, we will show how to build a touch sensor circuit using a 4011 NAND gate chip. In this circuit, we won't do anything too fancy but we will build make a touch sensor with a NAND gate chip and leave out a jumper wire, which when touched will turn on our LED. Both inputs of the NAND gate are tied together, so they will always share the same logic value. As you can see both inputs are connected to VCC, which is 5V, through a 10MÎ© resistor which serves as a pull-up resistor, so the inputs into the NAND gate are at a logic level of HIGH (or 1). According to NAND gate logic, 2 HIGHs at the input produce an output of LOW (or 0). So with this setup, the output will be LOW and will not turn on the load, which in this circuit is an LED. However, when we touch the touch wire, we are essentially acting as a resistor, creating a voltage divider circuit. Our body resistance can range anywhere from 100KÎ© when dry to anywhere to about 1KÎ© when wet. Either way, our body's resistance is much lower than the 10MÎ© resistor. So it only a small amount of the 5V falls across our body. Doing the math, the voltage that falls across our body would be V= (5V)(100KÎ©)/(100KÎ© +10MÎ©)â‰ˆ 0.05V, which is essentially 0 volts. The NAND gate reads this as a logic 0. (0.05V is way under half of the power supply voltage, which is 5V). So the logic level now at the inputs of the NAND gate changes to LOW (or 0). According to NAND gate logic, 2 LOWs at the input produce a HIGH logic level at the output, so the LED now powers on. This is a very basic circuit exploiting the principles of NAND gate logic to build a touch sensor.